Before you even walk through the front door, you are greeted by the rustic charm of this beautiful home. We had fun helping the KC family build this project just the way they wanted it. Blending hardie, brick and stone is a home trend that's here to stay. Not only is it a cost-effective alternative to completely bricking or stoning a house, it also adds a lot of interest to the exterior of a home. The KC family added metal awnings and cedar shutters to finish out the look resulting in a rustic and up-to-date exterior. Double islands, custom cabinetry, a built-in wine rack and stone accents make this kitchen a stunner with plenty of counter space and storage. Austin stone adorns the island and arches over the stove creating continuity between the kitchen and living room with a fireplace in the same stone. With two islands, the KC family, not only have plenty of counter space for cooking and entertaining, they also have a ton of storage and additional seating. The cabinets were custom designed with our trim carpenter and the KC family. They are job built, solid wood and stained. For the countertops, they chose Alaskan White Granite which brightens up the dark stained cabinetry. The living room, kitchen and dining area have an open concept so the KC family kept everything neutral and added the same stone from the kitchen and exterior to the living room fire place. 18X18 tile flooring is the perfect low maintenance option for their lifestyle. Double ceiling fans add extra lighting and plenty of air flow during the hot Texas summers. They went with a stained cedar mantle to accent the fireplace. The master bedroom serves as a nice retreat with a jacuzzi tub, double shower head, his and her vanities with a makeup bench for Mrs. KC, and large walk in closet. They added additional can lights in the bedroom above where the nightstands will be placed eliminating the need for lamps and providing individualized lighting with their own switches. This wing of the house will surely prove to be a favorite of the homeowners. All of the cabinetry throughout the home was custom, job-built and stained to match. Granite countertops and custom wood framed mirrors are in each additional bathroom. The dining area also has custom built-in cabinets with framed glass doors. We are excited to get the KC family in their new home and enjoying the result of a collabrative effort to bring this project to life. At Willmark, we take extra care to make sure your home is just the way you want it. Our service begins from our initial meeting to long after we are done building your project. Our team is always just a phone call away. 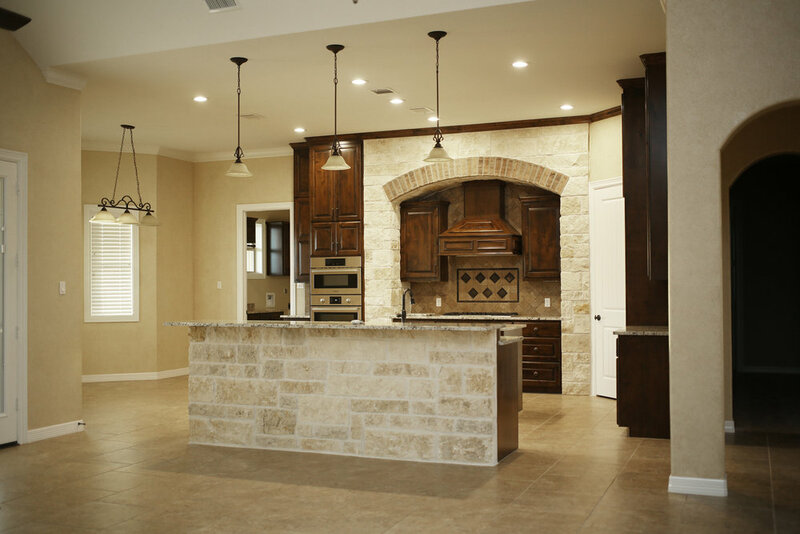 If you are ready to get started on your custom home or remodel, give us a call at 979-865-8977!